The Light operated and influences the mixing of the shattered vessels. If two liquids are mixed and left together for thousands of years, the heavy components of this mixture will sink and the light ones will float. Accordingly, the Light that shines from Above shines more on the light components, which as a result feel that they want to attain the goal of creation. This feeling awakens in them and so they can find no rest among the vessels of receiving. They can correct themselves, and they are called “Israel” which stands for Yashar – El (straight to the Creator). The general desire can be divided into two parts: the upper (Galgalta veEynaim – GE) that can easily be corrected and the lower (AHP) that is difficult to correct. The vessels of GE don’t feel an immediate awakening, but a gradual one, first on the level of the “forefathers,” then on the level of the “sons,” and then in the 21st century, it comes to us. Still the vessels of Israel awaken by themselves, because they have a point in the heart (•), which begins to appear at one point or another, starting from the time of Abraham to the present day to the Bnei Baruch organization (BB). There cannot be any awakening below. Here the desires to receive are in control, and they cannot awaken by themselves. Only after the first upper vessels correct themselves, they begin to awaken the lower by using different methods. First there were beliefs that Abraham had sent with the sons of the concubines to the East as gifts. Then different religions appeared. Finally we are using dissemination, which Baal HaSulam writes about in his article “The Messiah’s Shofar,” saying that we must bring the world the information about the correction that the Israeli nation has to perform. Thus we act and influence these layers, and in response they begin to join us and to rise. This means that the order of our correction is as follows: First we correct the vessels of GE (1), then the vessels of AHP of Aliya (on the rise) (2), and then the vessels of AHP in their place (3). Today we are in the first phase when Israel is being corrected. In general, this drawing shows the whole vessel that was created with its two parts: GE and AHP. In it, the people with the point in the heart are above, and it can be anyone, no matter where he lives. 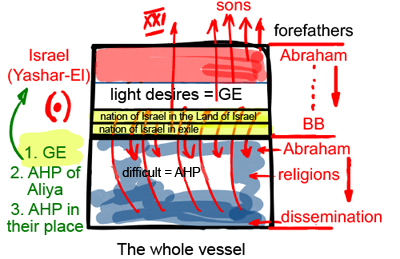 The layer marked in yellow is also divided into two parts: the “nation of Israel in the land of Israel” and the “nation of Israel in exile.” Both parts have points in the heart, but they haven’t awakened in the second part yet. A rabbi in brooklyn needed a typist. I happened to be there [not jewish] and offered to help. He dictated a mothers day statement to be read. [these were 2nd and 3rd generation jewish people]. It stated this home was temporary and all would go back home to Israel someday.. How do you think I felt? I’ll tell you . I did not think those people belonged there , using America without appreciating the shelter they were given. I’ve felt used by them ever since and wish they would all go back to Israel. Their attitude has been experienced since and I ask anyone why don’t they go back? They’re so greedy and prosperous here in America. That’s why they don’t leave. It’s all attitude that they don’t get the correction you write about. N.N.